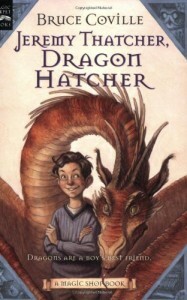 A children’s book about hatching and raising a dragon is always a welcome change from the real-world. This particular children’s book on the theme has a lovely simplicity and innocence about it. The book reminds me of the more recent children’s book, Tuesdays at the Castle, but I think this book has a much more appealing, gentler, and even mystical aspect to it. The book is an easy read, and for good readers, could be finished rather quickly, which is sometimes very satisfying. At the same time, the deeper message of letting go of what you love, is what gives the story a bit more depth than other books like this. I also think this is a great children’s book for boys, because of the main character. The book feels perfect for 8 to 11-year-olds. There’s not much else to say about the book, other than that it is a worthwhile addition to a child’s library of books. I have noticed that the author has written many many other children’s books. I tried at least one of them, did not like it, and have not liked any of the titles of the others. I believe this children’s book was written early in his career. Perhaps that’s why it works!